Every resort-style villa simply has to boast at least 4 bedrooms and golf estate location, don't you agree? Gated community and magnificent condition also, isn't that so? We couldn't agree more! 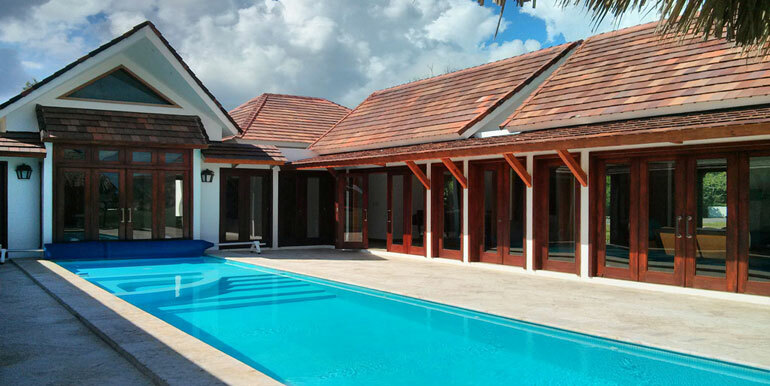 So you can see why we're so excited to list this 6400 square foot villa. Don't assume the highlights cut short there either. This fine abode boasts 4 bedrooms, ensuites to all bedrooms, off-street parking, 5 bathrooms, fashionable living area, modern pool, and amazing value for your dollar. Also you'll highly rate its beautiful bedrooms, private golf complex, onsite caretaker, and fully furnished for your convenience. Great place and Anna was an amazing cook! THanks Pieter! Your family was beautiful and all the staff enjoyed the time we host you! Esplendido Beautiful secluded property with lovely pool. We would definitely stay here again! The Hostess was very helpful and quick to respond. Rosie and Anna (cooks for hire) were very accommodating and the food was delicious. The private beach and lap pool and tennis courts were also fantastic. Punta Cana is a great beach getaway with reliable weather and friendly locales. Our pool was cleaned daily and the grounds impeccable. I felt secure with in the confines of the Golf Club but armed guard posted outside of our home made the rest of the family nervous. Some things other travelers might want to be aware of: no dishwasher (Rosie and Anna took care of this for us on the day they were working). No real hot water to properly clean dishes. Loud Music at night from resort till 11:30 or sometimes later. Definitely recommend a car (beach, lap pool, tennis far too far to walk). The layout of the house would not be ideal for families with smaller children. (Master bedroom has no direct access to the rest of the house so you need to lock yourself out or everyone else in). Power in the DR is very expensive (probably the reason why there was no hot water) and if you need Air Conditioning to sleep at night be prepared to pay extra for Hydro. Once again place is spectacular, private, clean and great for kicking back and enjoying some Island Life! All travelers in our crew gave it the thumbs up. Me in behalf of all people who work in this villa, we want to thank your for sharing this review! It was an honor to host you. Dahi is an amazing host. I highly recommend having her set up the cooks for your stay as well. What a fantastic experience! If you're looking to do something outside of the all inclusive resort thing, give this set up some serious thought. It's significantly cheaper than most of the all inclusives, especially if you're in a larger group. Granted this house would be way more expensive if it was right on the beach, but it's only a few minutes to the beach in golf cart. Advantages over an all inclusive: Feel more privacy Get "off the resort" a bit more, if you want to be completely isolated from the local community, then you may be better off in the large resorts Significantly less expensive as you don't feel obligated to stuff your face and get drunk every four hours so you feel like you're getting a good value for all the money you paid Dahiana makes everything easy, from airport transfers to setting up excursions. The best thing you can do is pony up extra for the personal cook. The food was out of this world, and she even catered to the one vegetarian in our group. For disclosure we were a group of four guys who were down here just to unwind for the week, relax during the day, do an excursion or two, and check out the nightlife a few of the nights. This was so easy to set up, and everything went smoothly during the week. One thing to remember is that everything is negotiable in the DR. If you know how to haggle, then you can be even smarter with your money. Book with Dahiana, you will not be disappointed. Thanks so much! Such a pleasure to host you! Thanks so much for sharing! I am deeply thankful Nienke ! It truly means so much you enjoyed your time! I'm looking fwd to see you again soon ! Gracias Justin! Dahi is great and you cannot go wrong with her as your hostess - BUT some issues would make us hesitate staying in the same place - there are only 3 full bathrooms for guests; despite being very conservative with electricity , paid extra; working golf cart is a MUST if you want to go to the beach- which is a nice sliver of private beach or consider car rental. Makes you sure you know what "maid service" involves. Loved the location and the cooks, Anna & Rosie, made great meals. Overall- Dahi was a wonderful host that quickly addressed all of our requests and needs. She is truly a professional at what she does. Even if we do not return to this property in particular, we will certainly look for another home she manages. Thank you Dahi! Gracias Anna, your words means a lot to me. This can help me to get better in the future! Dahiana was fantastic, very available when we had questions and concerns, took care of thing immediately. Arranged taxis,dinner reservation and cooks for pir stay. She is so bubbly, sweet and kind, we loved her, couldn't have asked for a better host. Dahiana made our stay fun and relaxing. We would definitely want her to host our next vacations home. Thank you Dahiana! Ahhh Stephanie Gracias !!! Im so glad you enjoyed your time. It was a privilege to have you! Hope to see you soon! This is a beautiful secluded home with gorgeous view of a golf course. It is a short trip to the beach with a golf cart (definitely recommend renting one). The beach is quiet and not too busy. Dahiana is an AMAZING hostess, very accessible and responsive, and willing to assist to ensure you have a wonderful vacation. The cooks are WONDERFUL and I highly recommend - the food was delicious and local. We were 8 women staying here for a girls getaway weekend and we had a wonderful time. Note: Solely due to the layout, I would not recommend this home for anyone with young children. I honestly cannot say enough good things about staying at this home. From the minute we walked in we knew our stay was going to be epic. We were a party of 5 and this house accommodated all so very well. The pool area is where we hung out for the majority of the time. Which was perfect because you can access it from almost every section of the villa. Everything was shiny, clean and new. We joked around about purchasing the house on multiple occasions... It really is a great house. Felipe was our awesome host during our stay. He was always available and extremely helpful; offering tons of sensational suggestions for various activities in the area which made him our 'go-to" person for all things fun and exciting. We decided to have meals prepared for us 4 out of the 5 days there. Our cooks were Anna and Rosie and they are nothing short of AMAZING on every level. They were warm, friendly, funny and genuinely sweet. They seriously felt like family. Upon our arrival they prepared the most delicious traditional Dominican meal. We will all remember these women and their mouthwatering creations for a long time to come. Dahiana, who we booked the house through was also very helpful and super attentive. We were there for my birthday and we wanted the whole experience to be special. She went above and beyond the call of duty to ensure that we had the best possible stay. She also organized the birthday dinner and (unbeknownst to me) got my housemates in touch with the restaurant manager to get a special cake made with candles and everything. Truly spectacular holiday in Punta Cana! Cannot wait to return. Me, and all the Staff of the villa are deeply thankful for sharing your experience with the community. It was a pleasure to host you, looking forward to hear from you soon! Dahiana made us feel very welcome when we arrived, she was energetic and really knew her away around Punta Cana and the best places to shop, have some drinks and have a nice beach day, and that is information really valuable when on vacation. She was always available for me and my family, and helped us immediately with everything we needed. The house was good, too. You can get a good tan around noon. Haha. I'd say to watch out for electricity cause we had to pay a $30 dollars difference when we left. The Dahi and her team is really amazing. The cooker and the manager are really helpful and patient. If you want to come to Punta Cana, I'm really suggest you live in the villa strongly. I appreciate so much your visit. Xie Xie He! The house was AWESOME. Beautifully decorated and well maintained, it looks just like the pictures. The house is kind of far from the beach the golf cart is a must. It's about a 15 minute walk. Or renting a car would be a good idea if you want to go anywhere other than the golf club and resort. The beach is beautiful almost no one was on our section of the beach. It is nestled between two large resorts so there are still many vacationers walking by the beach. Having a cook was one of the best parts of the vacation, Anna was amazing! She was so sweet and made delicious food. We asked for a very authentic Dominican menu and she definitely delivered. Dahiana was also amazing! So attentive to anything we needed at anytime of the day. She is also just a complete joy to be around. I recommend booking with Dahiana she was the greatest host I've had on Airbnb so far! The pleasure was all mine... Thanks for your visit! I hope meet you again soon. The place was clean and the service was very friendly. I would stay there if I visited again. Everyone made us feel very welcome and everything was better than expected. Dahiana was a great host right from the beginning with so much energy and enthusiasm! She was very helpful in providing insight and options on a variety of different types of entertainment, nightlife, restaurants, and just things to do. I would say she went above and beyond and was always available to answer any questions or provide any recommendations. The property itself was very beautiful and well maintained. One thing that I didn't see mentioned in the description was that there was a 24 hour security guard specifically for the villa which made us feel really safe at all times. We had opted to go with the chef option for our daily meals and Blanca made the most delicious dishes. She was open to cooking whatever we felt like but we left it mostly in her hands to cook us authentic Dominican dishes which we thought were great! The local property manager Felipe had referred us to a driver (Franklin) and he was also great. He knew all the places we would like to go including the less popular local spots. He was very attentive and punctual and would go out of the way for any requests at any time. The walk to the beach felt a bit draining some days as it took about 15 to 20 mins in the Dominican heat, but it was well worth it once we got there. There is also an option to rent out golf carts for a daily rate if you don't want to do the walk. Overall a fun and memorable vacation and Dahiana and her staff made it all the better! Can't wait to be back! We felt very welcomed by Dahiana and her team in Punta Cana. They were all very friendly and had a problem solving attitude at all times. They made our stay a very enjoyable one, Dahiana totally went above and beyond to help us with any inquiry we had and she was always available for us during our stay which was very important for us. The property, except for minor details, was as described in the listing and in the pictures. The neighborhood is very quiet which if it is what you are looking for, it's great. The beach was amazing, private however in the middle of huge hotels so consider you will see lots of people and by-passers. Dahiana was the most attentive and helpful host I have met so far. Responded to all our messages within the hour, went above and beyond to help make our experience impeccable. Keep up the great work! Thanks so much for visiting us! It was a pleasure to host you. See you soon! The stay the at the Villa was absolutely amazing! This was one of the best family vacations we have been on. Dahiana was a great host and everyone she worked with was so friendly and helpful. We have stayed at many different all-inclusive resorts and I have to say this was way better and definitely they way to go. The pool was amazing; to walk out your bedroom door and be at the pool was a huge plus :) We brought some floating chairs and a volleyball net that kept the whole family entertained. The beach was a short golf cart ride away and was gorgeous. I would also strongly recommend to purchase the cook. The food was amazing and it was so nice to not have to cook while on vacation. Our cook was able to make pretty much anything we asked but the tacos and fried plantains were definitely a hit. I would recommend to bring a lot of cash, as you pay for the food, beverages and the cook in cash. Dahaina also helped us book some excursions. We did dune buggies and snuba and both were a ton of fun! If you do the dune buggies, go early in the morning so you can drive through more puddles and get real dirty. All and all my family had a great time at the Villa and would definitely come back! Dahiana is the best, def. look forward with booking with her again for our yearly trip to Punta Cana! Amazing home with all the amenities, on a private golf resort with private beach access. What else could you ask for? Rossi was there to make the absolute best food on the planet and make our stay fabulous. Dahiana was extremely attentive and kind. We WILL be back soon. Dhai was an amazing hostess and went out of her way to make sure we had an amazing time. We will definitely use her on our next trip to Punta Cana.